POSCO acquires lithium mining rights in Argentina. August. 28, 2018 08:17. by Eun-Taek Lee nabi@donga.com. South Korean steelmaker POSCO said Monday that it signed a contract to buy lithium mining rights in Argentina. This is considered a part of the steel giant’s latest efforts to secure raw materials such as lithium and iron ore under the judgement that lithium-ion batteries (secondary cells) will become the source of profits in the future and those getting hold of natural resources will lead the market. POSCO signed a deal to buy a package of mining tenements in Argentina from Australian lithium miner Galaxy Resources on Monday (local time). 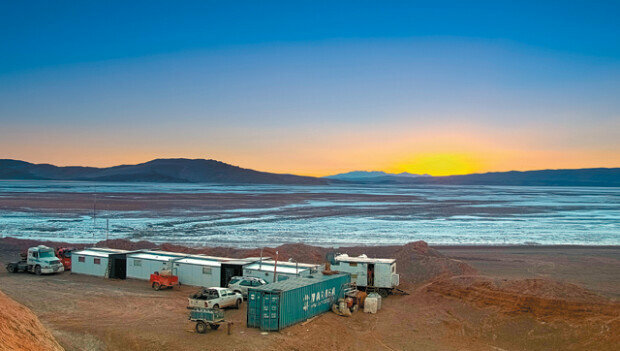 Since founded in 1973, Galaxy Resources has focused on lithium exploration and development in Australia, Canada, and Argentina. The contract gives POSCO mining rights for an area of 17,500 hectares in a northern sector of the Salar del Hombre Muerto salt flat in northwestern Argentina. The area is as large as one-third of the city of Seoul. With the contract, the South Korean steel producer will be able to produce 25,000 tons of lithium a year for 20 years. Lithium is a critical ingredient for lithium-ion batteries, and 25,000 tons of lithium will make the batteries of some 550,000 high performance electric vehicles. Lithium-ion batteries are primarily used for electric vehicles, and amid expectations that the global demand for electric cars will exponentially grow, businesses around the world have engaged in a war to secure the resource. Lithium or lithium chloride are generally extracted from mines or salt lakes, and it is estimated that some 80 percent of the world’s lithium is buried in Bolivia, Chile, and Argentina. POSCO invested 280 million dollars (around 310 billion won) to seal the deal. Earlier in March, POSCO joined a consortium with Samsung SDI to build a plant in Chile for the country’s lithium batteries project. In February, the steelmaker signed a contract with Australia’s Pilbara Minerals to secure supply of chemical grade spodumene concentrate, mined for its lithium content. Its affiliates POSCO Chemtech and POSCO ESM are producing anode and cathode materials for lithium-ion batteries.